« New Breed Wrestling presents The 2nd Annual Kris Wyatt Memorial show! PWP Live Pro Wrestling! September 19th in Omaha, NE! If you’re a WWE fan, you’ll love PWP! 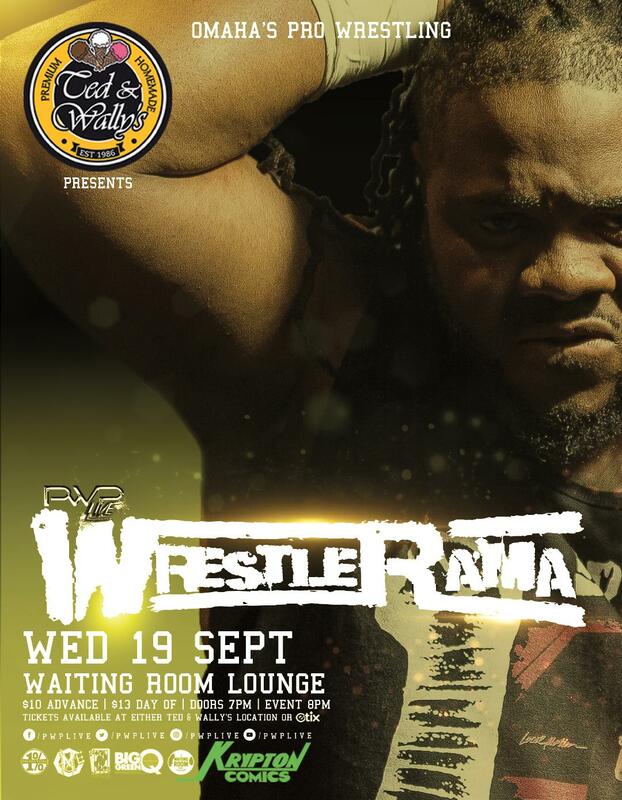 PWP Live returns to The Waiting Room Lounge on Wednesday September 19th with WrestleRama!! – presented by Ted and Wally’s Ultra-Premium Homemade Ice Cream! Last month, Con Artiest won the Battle of the Phoenix fair and square, but Duke Cornell forced the match to restart….resulting in a “victory” for Duke. As the 2 men argued over who should get the rightful title shot, Juarez was quick to come out and suggest that both men would get a shot in a TRIPLE THREAT MATCH!! The rivalry between these two teams has spiraled out of control, with Powers and Carter leaving Johnny Ruckus laying and unable to compete, and Lars Metzger with a badly injured knee last month. Midwest Blood have made it clear that are coming not only for revenge – but for the PWP Tag Team Titles as well!! In the Battle of the Phoenix last month, Purple eliminated Moonshine Russell….only for Russell to come back out later and help Duke Cornell eliminate Purple. Purple wants revenge for being robbed of his opportunity – but Russell has made it clear that he is only interested in a match if Purple’s PWP Rising Phoenix Championship is on the line – which Purple had no problem agreeing to!! Advance tickets available now at Ted and Wally’s Ultra-Premium Homemade Ice Cream (both Old Market & Benson locations). This entry was posted on September 11, 2018 at 8:33 pm	and is filed under Uncategorized. You can follow any responses to this entry through the RSS 2.0 feed. You can leave a response, or trackback from your own site.